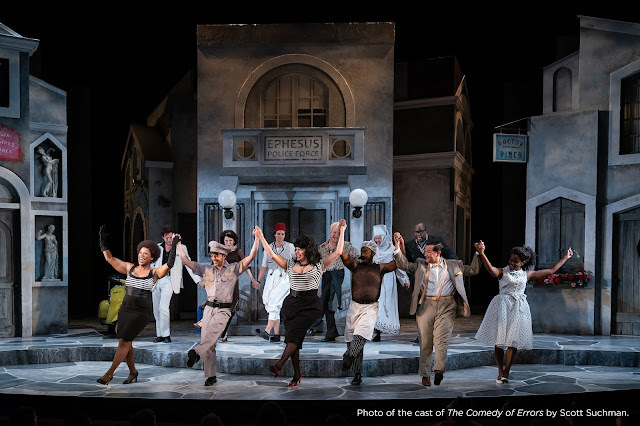 If you have any lingering doubts, the Shakespeare Theatre’s current production of Noël Coward’s Design for Living will dispel them. With this production, Michael Kahn has cemented his standing as the world’s best director of drunken scenes. Leo and Otto (Robert Sella and Tom Story) stumble around, lamenting the fact that Gilda, the woman who has loved both of them and cheated on both of them with the other, has finally left both of them. They toast to her, to friendship, to drinking. Sella and Story’s acting is a study in specificity. Each drink is swallowed slightly differently. Their speech becomes more and more slurred, yet somehow always understandable. Sella’s limbs get more and more rubbery. Finally, they fall exhausted into each other’s arms. directed by Michael Kahn. Photo by Scott Suchman. It is in this scene that the play reaches the pinnacle of its entertainment value. Sella and Story’s chemistry is fantastic, and really the driving force behind the entire evening. The first act seems slow, the third act takes a little long to get to its inevitable conclusion (though still delightful due to Leo and Otto’s cocky self assurance), but the second act, oh the second act sparkles. Gretchen Egolf as Gilda is given one of those impossible jobs of being a woman that the audience has to fall in love with instantly. She must be everything a woman should be and utterly irresistible. Egolf does a fine job and has excellent comic timing, but Gilda doesn’t quite ascend to the goddess that Leo and Otto make her out to be. Part of the problem is that Coward has written Gilda as flighty and whiney. In fact all three of the characters can come across as unlikable and self absorbed. But the charisma of the two men, particularly Story, works in their favor. 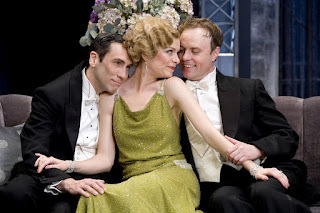 in Noël Coward’s Design for Living, directed by Michael Kahn. Photo by Scott Suchman. Catherine Flye gives the strongest performance in the supporting cast. She brings a dry delivery and perfect physicality to Miss Hodge, Leo and Gilda’s maid. And if you like seeing beauty at the theatre, this would be a production for you. 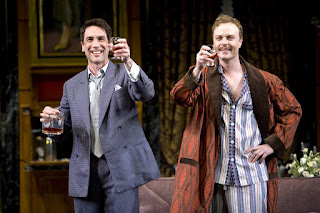 Noel Coward demands beauty, and the Shakespeare Theatre delivers with sumptuous sets by James Noone and gorgeous costumes by Robert Perdziola (even the pajamas are lovely! ).